All transactions are safe and secure with a reliable history in online purchasing behind each of our associates. 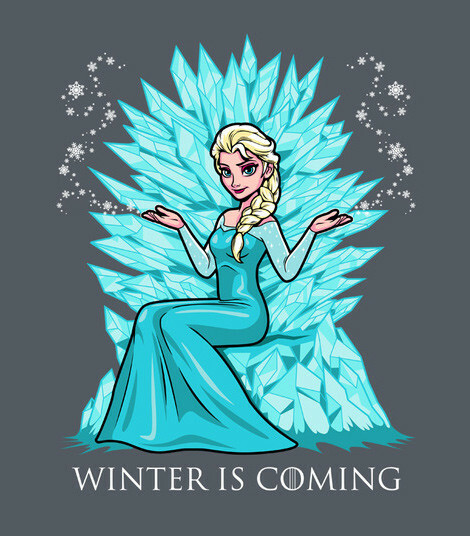 Buy the Elsa is Coming t-shirt to own Game of Thrones clothing and merchandise. There is no arguing that both Elsa the Snow Queen and Daenerys Targaryen possess magical abilities, just in the opposite spectrum temperature-wise. This Elsa is Coming shirt features Elsa from Frozen sitting on the Iron Throne in King's Landing. Pair it with a House of Baratheon HBO Game of Thrones tee that features the antlers from their crowned stag on gold like on their Coat of Arms, along with their saying, 'Ours is the fury'. To read about their conquests, check out George R.R. Martin's A Song of Ice and Fire book series that inspired the medieval HBO TV show. In addition to the Elsa is Coming tee above, browse the Game of Thrones Clothing Gallery for more apparel like men's and women's clothes, kids shirts or hoodies.